After being founded in 1944, ENRIQUE KELLER has grown to become one of the largest manufacturers of classical guitars in the world. Our guitars are highly respected by musicians of all genres who value the extraordinary depth and richness of the sound produced by our guitars. In order to guarantee the quality of our core products we continue to make them at the company’s original location in northern Spain, Zarautz. 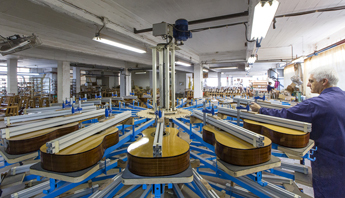 Here, our dedicated team of craftsmen and women produce the highest quality guitars using a blend of traditional techniques which have been passed down through the generations, combined with the latest modern manufacturing systems. This results in the unique instruments that we are proud to sell throughout the world, to more than 50 countries. Our guitars are handmade with the utmost care in all details which is the main ingredient to obtain high quality and the best performance. They are manufactured mostly in an artisan way by our team of luthiers. It is a highly qualified team, with an extensive experience in the handcrafting of this kind of instruments. 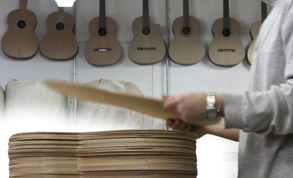 For the production of our guitars we look for and select the best woods all over the world. And we have a R&D&I Department continuously working to obtain the best sound with the highest quality. Creating a guitar is a very complex process whose duration varies depending on the model. After selecting the wood, the different parts from the guitar are shaped. Sonority and excellent finishes, the noble material employed in their crafting and the careful elaboration that entails all the handcrafting process of our guitars are values that make the difference when it comes to choosing an Admira. A wide range of models are available, among which you will find the guitar that fits you best, from the simplest ones, intended for beginners, up to the most professional instruments.